Travelers on the Mississippi River have used Tower Rock as a landmark for thousands of years. Located between Chester, Illinois and Cape Girardeau, Missouri, Tower Rock is a prominent geologic highlight for the Mississippi River traveler. Throughout the 19th and 20th centuries, artists traveling along this route have found this massive stone outcropping to be an irresistible subject for their work. Carl Bodmer, a Swiss artist in the employment of Prince Maximilian of Wied, passed this way in 1831. Bodmer's work is some of the finest documentation of life in the early days of America and especially the American West. If the viewer looks carefully, one will be able to see a small steamboat tied off for the night. This is the steamboat Yellowstone owned by the American Fur Company. She was an experimental boat built in 1831 to travel on the Missouri River. This is the boat that transported Carl Bodmer up the Missouri River to present day Pierre, South Dakota. In MISSISSIPPI RIVER FLATBOATMEN we are observing several flatboats descending the Mississippi River on their way to New Orleans. It was a common practice to travel in groups for protection. Here we see two boats tied together for a bit of recreation. In stretches of the river where navigation was easy, it was common to find two or more flatboats lashed together; thus, fewer men dealt with the navigational chores. The interpretation of the moment exhibits the end to a hotly contested card game. The emotions of the cigar smoking loser are not unnoticed by the confident winner and elated observer. The dog is even surprised by the loser's no doubt colorful language. 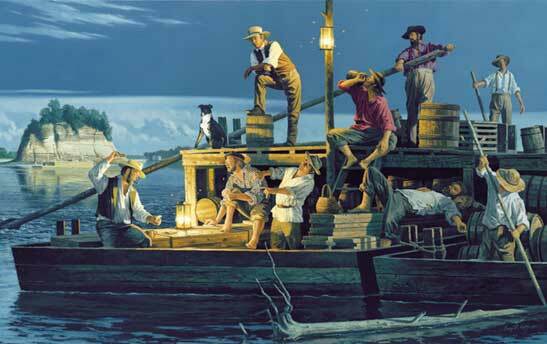 Liquor was the free flowing beverage of the rivermen. One of the crew is enjoying a nip of river comfort and another is definitely comfortable from a number of nips. 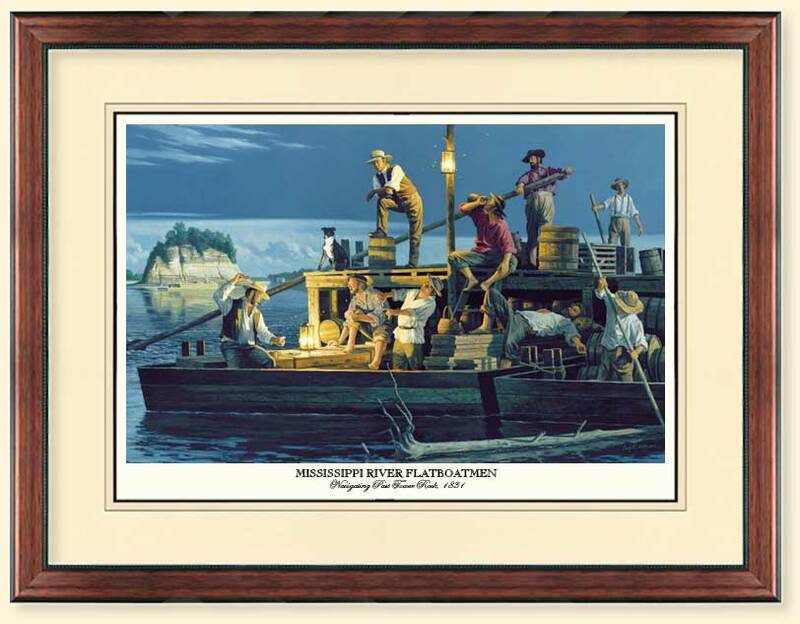 As the other crew members tend to the safe navigation of their craft, the flatboats will continue to float peacefully in the moonlight to their down river destination.